Avoiding risk of injury, health, illness, and harm to family members involves many potential household dangers. 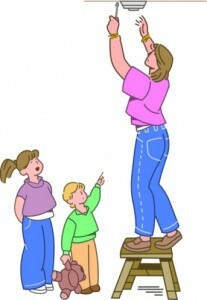 Your inherent common sense can eliminate or, at least, reduce many imaginable risks to you and your family. Many people often don’t realize that they face a higher risk of injury while in their home than most other places they spend their time. Just working in the kitchen, getting out of bed, or taking a shower present more risk than most other places you visit. Kitchens can be the most dangerous rooms in a house. They are fraught with hazards, including sharp knives, slippery flooring, unpleasant chemicals, and sharp edges on cabinets, countertops, and appliances. Pay attention to fire dangers. Stoves, ovens, and other appliances can be sources of fire and burn injuries. Young children are particularly at risk when you’re cooking. Keeping a fire extinguisher handy and staying alert at all times when cooking reduces the risk of injury. Mention exercise to some people—particularly devoted couch potatoes—and you’ll receive looks of horror, disbelief, and the always dependable, “deer in the headlights.” Those to whom the thought of exercise conjures disturbing images of overweight or muscle-bound people, sweating profusely, and pumping heavy iron, need to take a deep breath and just calm down. While you can certainly choose to spend your off-hours at a state-of-the-art gym working on your abs, arms, legs, etc., to create a sculptured body, it is not a necessity to feel healthier. 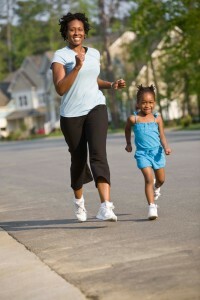 You can even exercise with your baby or young child, implanting wonderful, healthy habits at their young age. Flexibility. Stretching and range of motion exercises help everyone and can be done daily without consuming large blocks of time or risking injury. If you have arthritis or worry about getting “long in the tooth,” stretching will help you loosen up those annoying stiff joints upon rising in the morning. Among the more effective flexibility exercises are yoga and tai chi, but just stretching your arms (biceps and triceps) and legs (quads, calves, and hamstrings) are wonderful to keep you healthy and trim. One doesn’t have to look too far to find a news story about a “crazy” dad who screamed at the umpire or threw a tantrum on the sideline. The more powerful sports stories, however, are those that aren’t in the newspapers: the father who plays catch with his son every night until it’s too dark to see the ball, or who encourages his daughter to keep skating even though she has fallen down more than she has stood up, or who puts an arm around his child after losing the big game. Set up a basketball hoop in the driveway, and then challenge your dad to a game of one-on-one. If you’re feeling really generous, let him win. Turn off the TV. The typical dad may want to relax on Father’s Day but that doesn’t mean he has to sit on the couch and watch television. Turn off the TV and take him somewhere to do something active. For example, if he likes watching golf, go with him to the driving range. If he enjoys baseball, take a trip to the batting cages. Maybe the activity is as simple as just going for a walk together. Cook a healthy meal. For some families, figuring out what dad would like for dinner is a tough decision. This year, make sure the meal is healthy and made from ingredients that you know he likes. You can find lots of recipes online, but don’t stop there – buy him a healthy-cooking cookbook to tempt him to eat healthier all year long. If none of these gifts are quite right for your dad, find one that is, and make sure to give him a big hug as you give him his gift. Studies show that hugs can reduce stress, reduce heart rate, improve moods and lower blood pressure. The kids, the laundry, the job, the bills – when is there time to exercise? Fact is, if you don’t exercise, you won’t be able to take care of the kids, the laundry, etc… Here’s how you can do a squat here and some cardio there, when you seemingly don’t have even a minute to call your own. •	Walk around the neighborhood. Bring your child along in a stroller or carry your child in a baby carrier or sling. •	Dance. Gather the kids, put on their favorite music and shake those hips. •	Do squats, lunges, calf raises and crunches. You can do one exercise while watching TV, another while brushing your teeth, and another before showering. •	Take the stairs whenever you can. Ten minutes a day of this and your legs and glutes will thank you. Try to make it a habit to do something good for yourself – such as exercising. Even with little time on your hands, you can aim to fit it all in, so you can be fit and fabulous.